Plan advanced in congress seeks further US recognition of Israeli sovereignty in Golan, application of US-Israel trade agreements there. 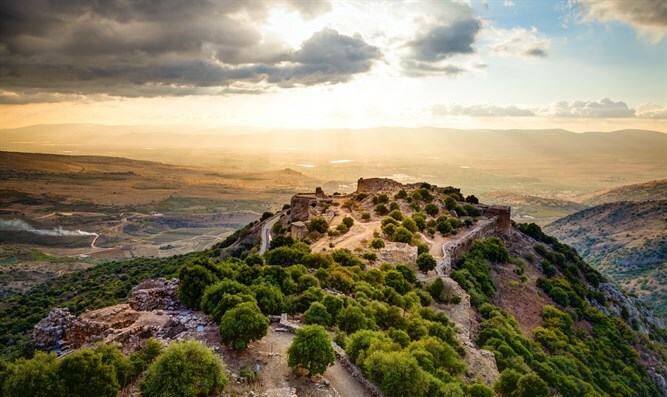 A plan to strengthen American recognition of the Golan Heights was presented last week to Israeli and US officials in Washington, Israel Hayom reported this morning, Sunday. At the center of the plan stand the application of Israel-US trade agreements to the Golan Heights and the drafting of a letter recognizing “changes on the ground” and their influence on the status of the Golan. The plan is part of an extensive effort by members of the US Congress, led by Senator Ted Cruz, to anchor the Israeli hold on the Golan Heights through American support. House Member Ron DeSantis has also promoted a similar initiative. The plan reportedly includes six sections: The channeling of budgets to joint Israeli-American projects in the Golan; Expanding the agreements between the United States and Israel, such as the Free Trade Agreement, so that they apply to the Golan Heights; Marking products of the Golan Heights as "Made in Israel;" A document by Congress stating that Syria will not return to the Golan Heights; The sending of official congressional delegations to the Golan; and the drafting of official congressional documents recognizing Israeli sovereignty over the Golan. At this stage, the exact wording of the letter of recognition by Congress has not yet been determined. However, according to one proposal, "In view of the changes that have taken place on the ground, including Iranian infiltration into Syria and Lebanon, it is unrealistic to expect Israel to withdraw from the Golan Heights."